I don't know if this is a silly question or not, so I'll ask it anyway. 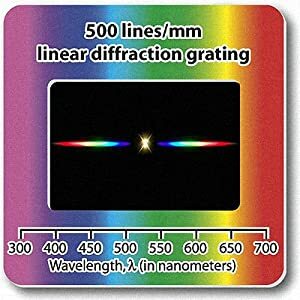 I am confused by the 13,500 line/inch diffraction gratings. They should be 13,500 line/inch or 532 lines/mm, but from observation they appear to be 5,182 lines/inch or 204 lines/mm. I do have 500 lines/mm and 1000 lines/mm gratings that I compared them to. Please be more specific about your observation. First, from when I was trying to measure different wavelengths and used the HeNe 632.8nm as a reference. Second, the general observation of the order spacing compared to 500 lines/mm and 1000lines/mm. My measurements were quite precise, but the lines/inch calculation I made might still be +/- a few percents. Oh, you're talking about these, yes? I just checked with the three I have, and the 13500/in does have the most narrow spacing, but that's the only one that has dual axis, so I suspect they're counting the lines in each axis? It's still a bit off from your measurement, but that would account for some of the error. Yes, those are the types. Hmm, I guess they might be counting both axes.